Tottenham have secured the services of South Africa defender Bongani Khumalo from SuperSport United for a fee of about £1.5m. The 23-year-old, who played at the 2010 World Cup, signed a pre-contract agreement in October after impressing in trials at White Hart Lane. "I am looking to learn as fast as I can and do all I can to contribute to this wonderful team," Khumalo said. The defender could make his debut in Sunday's FA Cup match against Charlton. 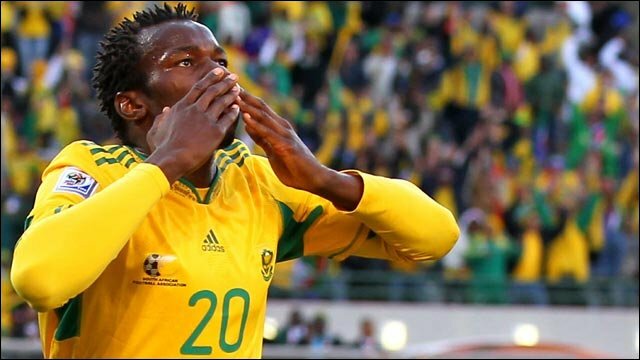 Khumalo was a regular for South Africa during the World Cup in his homeland, featuring in all three of their group matches which included scoring in the 2-1 victory over France. Tottenham manager Harry Redknapp said in September: "He's not expensive. We had him over on trial and we like him. "He has potential, we've got a tie-up with SuperSport, so we've taken him." Somebody who actually has been signed. Wonder if he'll play at centre-back this weekend? The arrival of the Swaziland-born defender will be a boost for a Tottenham side fourth in the Premier League and still involved in the Champions League. The north London outfit have also struggled with injuries to Michael Dawson and fellow centre-back Jonathan Woodgate this season. "It will be a great chance for the kid," added Redknapp of Khumalo. "He's a great lad. He comes from a poor background and he's desperate for a chance and we're going to give him a chance." Speaking after the World Cup, Khumalo said it would be a "dream" to appear in the Premier League. "I have always wanted to play in England, and obviously in the Premier League, and it would be a dream to move to Tottenham," he stated. "Playing in the Champions League would be another dream. I think the Champions League is the closest level to the World Cup in terms of quality and the play, so it would be great to make the move." The South Africa international captained Supersport United to a record-equalling third straight Premier Soccer League championship last year, becoming the youngest captain to lift the trophy at the age of 22. Khumalo told the Spurs website on Friday: "I want to win games here, I want to win titles - that's what the game's about. "I've been fortunate to experience some success in my career back home lifting trophies and I would like to do the same here. The feeling is addictive. "It's a higher level, it's not easy but I'm going to give it my best and contribute as best I can to the team's success."